Short on time? Combine Buenos Aires’ headline acts into a short and sweet 4-hour tour. 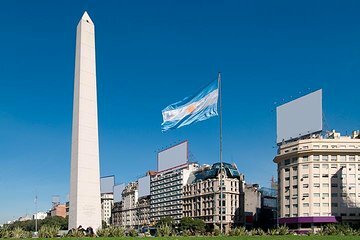 Admire the grand architecture of Plaza de Mayo, Plaza San Martín, and Plaza Congreso; drive down Avenida 9 de Julio, past the towering Obelisk and marvel at the modern architecture of waterfront Puerto Madero. You’ll also get chance to glimpse the colorful houses of La Boca, see the famous La Bombonera football stadium and visit historic San Telmo. Great tour of a great city! A little more stops to take pictures would have been nice, but this tour gives your perfect overview of the city if you only have several days here. We took this tour on the 1st day, and next coupe days we knew where we would like to go to walk around and take pictures. Be aware of the Boca stop: tango people tell you it's 10 Argentian dollars to take pictures, then after you take pictures with them, they say it's 10 US dollars and for each person! My husband and I are just two naive tourists, who got tricked by them! The Tour is a reasonable price. but, you don't get much free time on the tour. it mainly consists of driving around on a bus. You get 25 minutes at Plaza de Mayo, which isn't enough. The other stop is in the Boca district, which consists of looking around souvenir stores. I was picked up more than 30 minutes late for the tour and I even called the company to ensure that I was being picked up. It is also an annoyance having to contact the company beforehand to confirm your tour. One would think that actually paying for it would accomplish that. Also, you don't get dropped off back at the hotel, but, at a location relatively nearby. There was also a young woman on board taking pictures of people on the tour and getting them photoshopped onto cards and trying to sell them as souvenirs for 20. Also, bear in mind that the tour doesn't visit the Recoleta cemetery, which seemed to be the biggest attraction in Buenos Aires and only drives by the Obelisco without stopping. Consider paying more for a more comprehensive tour. Booked an English speaking tour but had to share with a Spanish speaking tour. The tour guide said everything in Spanish first speaking for quite a long time then gave a very short English version. After the first hour had very little of interest pointed out. Spent most of the time talking about the first settlers in Buenos Aires and the origins of the Tango. Tour included a 20 minute stop at an indoor market where we were told we could buy some ice cream a 50 minute stop in the Boca area which lasted for an hour we saw everything there was to see in 15 minutes. Had the cemetery where Eva Peron was buried pointed out in the distance but given no time to look at it. Tour finished 15 minutes early. To sum up: out of an advertised 4 hour tour we spent ony 2 hours 25 minutes on the tour of which most was in Spanish so we only had about 30 minutes in English and did not get to see the main attraction of the Recoleta Cemetery. Waste of time and money. Excellent tour for the price. Need more time at Recolrta Cemetery. The Caminito section at the end was my favorite. They do not drop you off at your hotel so be prepared to walk a few blocks. Já fiz muitos City Tours, este foi o menos interessante de todos. Não pela cidade de Buenos Aires, que é linda !, mas pela total falta de empolgação da guia Sara O motorista Daniel até que era animado. Começamos muito mal, sembarcando no monumento da Flor Mecânica, muito bonita e interessante. Só que Sar disse que nos explicaria a importância do monumento DEPOIS da visita. Dá pra entender ?